Stained Glass Window Stamp Set – One stamp three ways! 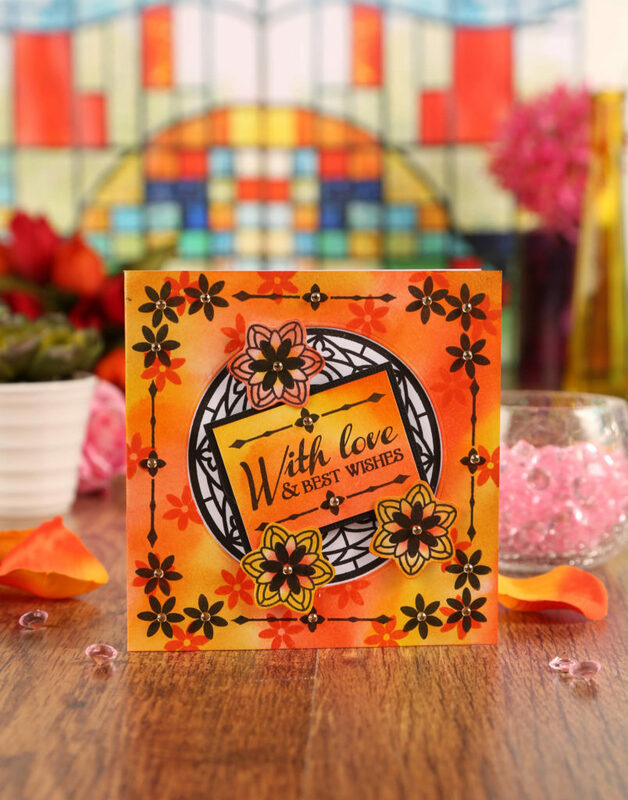 Nicky Gilburt, Editor of Creative Stamping has created three striking designs using one of our Pretty Quick Stained Glass stamp sets. 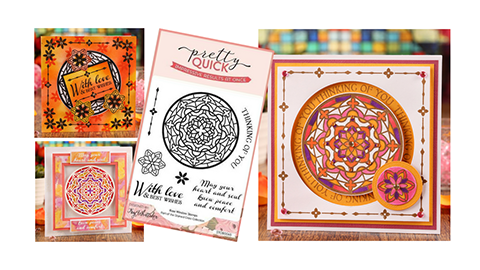 This stamps set is one in a range of beautiful stamps by Pretty Quick – find the full range from this brand here – Pretty Quick stamps and dies. We have limited stock of this range, so do pop one in your basket if you like the look of these gorgeous cards – they’re just a little different and we think you’ll really enjoy colouring the stained glass. What you’ll need from your Craft Stash! 1 Cut a 5”-square piece of white cardstock and use Acorn Brown ink to stamp the border around the edge. 2 Stamp the window into the centre and die-cut using the nearest circle die in size. On the remaining square die-cut a circle in the centre 2cm larger in diameter, this will be the frame for the spinner card. 4 Cut a 5¼”-square piece of yellow cardstock and lay the white frame over it. Use the outer circle as a guide to stamp the sentiment four times in onto the yellow cardstock as shown. Colour the window and flower using alcohol markers. 5 To create the spinner mechanism die-cut two penny-sized circles and attach together using a 5mm circle of 3D foam tape. Apply a thin width of foam tape around the edge of the white frame and adhere to the yellow panel, then layer this onto a slightly larger piece of pink cardstock and attach to the card front. 6 Add 3D foam tape onto the reverse of the window and fix into place with the spinning mechanism in position at the edge of the circle, sealing it into the channel. Adhere to flower embellishment to the spinner. 7 Add gems to each corner of the frame and the centre of the window and spinner to finish. 1 Die-cut a circular aperture the same size as the rose window to the card front. Colour the card front using Distress Inks, blending them together, and stamp the small flower all over the front using Ripe Persimmon ink. Use black ink to add a flower border as shown. 2 Cut a 4½”-square piece of white cardstock and use black ink to stamp the rose window then fix the panel behind the aperture. 4 Stamp three larger flowers, cut out and colour using Distress Inks. Colour the centre petals in black to match the outer flowers. 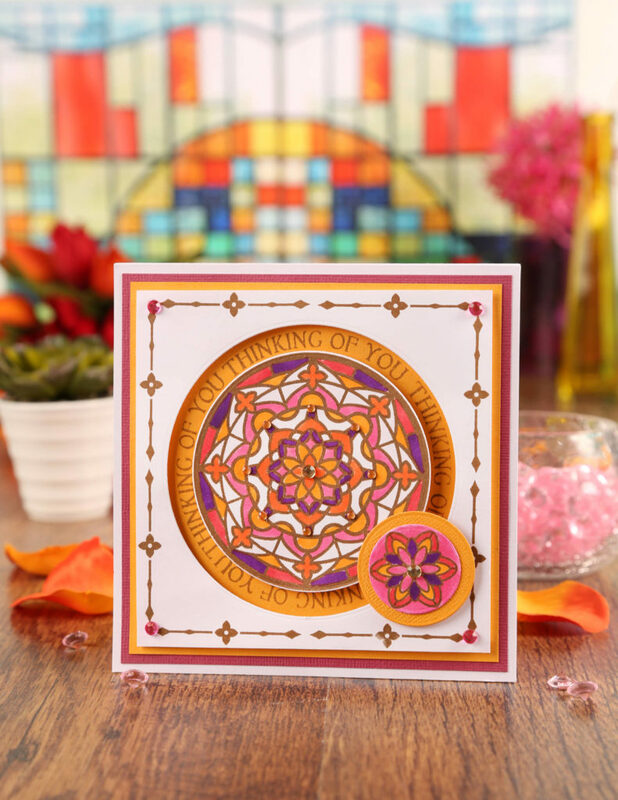 5 Mount the sentiment panel and three flowers onto 3D foam pads and arrange onto the card front over the rose window. Embellish the centre of each flower with gold gems to finish. 1 Cut a 6”-square piece of vellum, stamp the flower randomly around it including over the edge and heat emboss using white powder. 2 Cut a 4¾”-square piece of white cardstock. Rub different colour Distress Oxides onto a glass mat and spritz each one with water, then use a paintbrush to apply colour all over the cardstock. Leave to dry. 4 Create a frame by cutting a die-cutting a centre square out of the inked cardstock and mounting onto a slightly larger coral square frame, then attach the acetate square to the reverse with the embossed side forward as shown. 5 Attach the completed frame to the vellum using 3D form tape then apply glue to the back of the vellum, behind the frame where it won’t be seen and adhere to the card front. 6 On the off-cut of inked cardstock, stamp the greeting and heat-emboss in white. Trim to size and carefully split the greeting, mounting each piece onto a slightly larger piece of white cardstock. Attach both panels to the card front to finish.